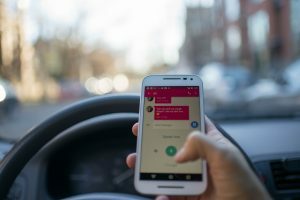 Everyone talks about the dangers of texting and driving, but most people don’t think about the potential penalties of driving and texting if they happen to get caught. There are many fines and punishments that can be imposed for violating this law, but there are also ways to beat the laws in some cases. California is one of the many states that is cracking down on the use of smartphones while driving, creating stricter laws and punishments for drivers of all ages. Studies done have shown that 1 of every 8 drivers is using a smartphone while driving, and giving it as much as attention as they are giving the road. It has been estimated by safety officials that 80% of crashes in California involve some kind of distracted driving. Lately, it has been predominantly distraction due to cell phone use. The law was designed to cover all types of smartphone use, including social media, music applications, video chats, and other features that are completely unnecessary while driving. Those who were using speakerphone or were parked while using the device should also not be cited under the new law. Any driver under the age of 18 is not allowed to operate a vehicle with a cellphone or any other device in their hands, at all. Unlike adult drivers, teens have less experience on the road. Lawmakers felt that drawing the line for exceptions at the age of 18 was wise to increase driver safety and help teens develop safe driving habits. According to the vehicle code that the new law falls under, someone cited for driving and texting could face an initial fine of up to $150, depending on the situation in which they were caught using a cellphone. Typically, a base fine of $20 is charged for the initial offense. Subsequent offenses will start with a base fine of $50. These amounts do not include any additional fines for additional violations, court costs associated with fighting or paying the ticket, or other fees that may be assessed. Those charged with this citation should ask the officer the amount of the fine. If they cannot provide it at the time of the traffic stop, they will advise the driver on how to find out what the fine is going to be. At the officer’s discretion, some citations may be issued with a required court appearance in lieu of a straightforward fine, but this is rare. In order to avoid a citation for driving and texting, drivers must be using the device in a hands-free manner. Aside from the exceptions listed above, the phone cannot be in the driver’s hands at any time. Many people rely on the use of voice-activated features and car audio integration, where they can access the phone’s necessary controls from the radio dials or the steering wheel controls found in most cars these days. Although the law goes into further detail stating that a driver can only touch the phone once without being cited, it is unlikely that will be easy for law enforcement to track. Phones must be mounted on the vent, console, dashboard, or windshield of the car, and cannot block the line of sight for the driver. Following these guidelines will prevent driving while texting citations in California. Contact us today if you need help in fighting a traffic ticket. We have over 25 years of experience fighting traffic tickets and helping people reinstate their license.